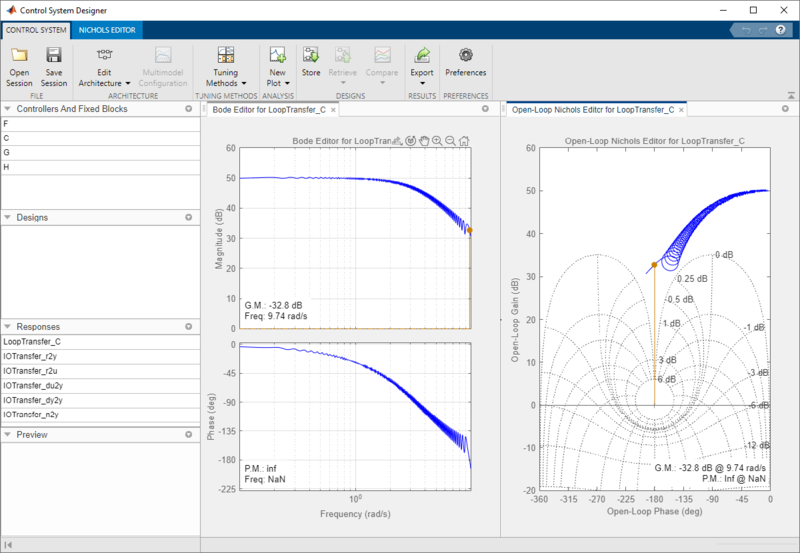 This example shows how to design a compensator for a plant model defined by frequency response data (FRD) using Control System Designer. 1) Signal analyzer hardware that performs frequency domain measurements on systems. Example: Frequency Response Estimation Using Simulation-Based Techniques (Simulink Control Design). The frequency response of the engine is already estimated. Load and view the data. Gain margin greater than 20 dB. The Control System Designer opens with both Bode and Nichols open-loop editors. 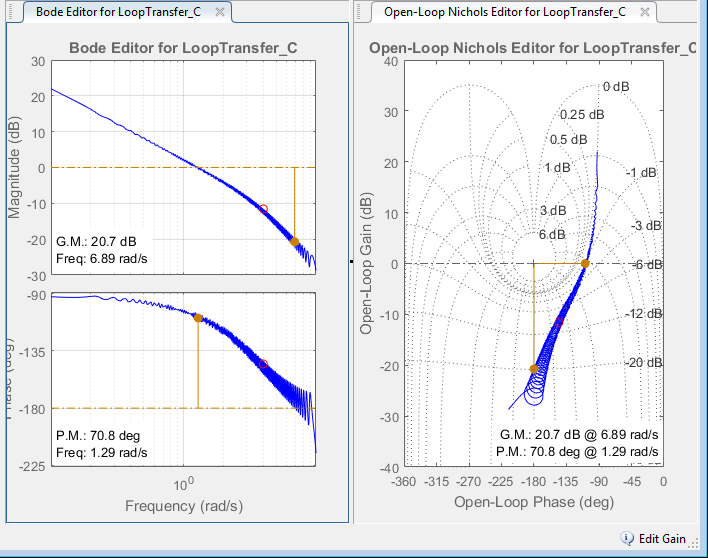 You can design the compensator by shaping the open-loop frequency response in either the Bode editor or Nichols editor. In these editors, interactively modify the gain, poles, and zeros of the compensator. To satisfy the tracking requirement of zero steady-state error, add an integrator to the compensator. Right-click the Bode editor plot area, and select Add Pole/Zero > Integrator. To meet the gain and phase margin requirements, add a zero to the compensator. Right-click the Bode editor plot area, and select Add Pole/Zero > Real Zero. Modify the location of the zero and the gain of the compensator until you satisfy the margin requirements. This compensator design, which is a PI controller, achieves a 20.7 dB gain margin and a 70.8 degree phase margin. Export the designed compensator to the workspace. Click Export. 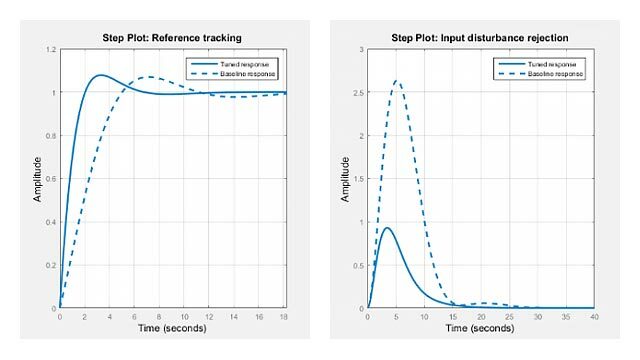 Validate the controller performance by simulating the engine response using a nonlinear model in Simulink®. 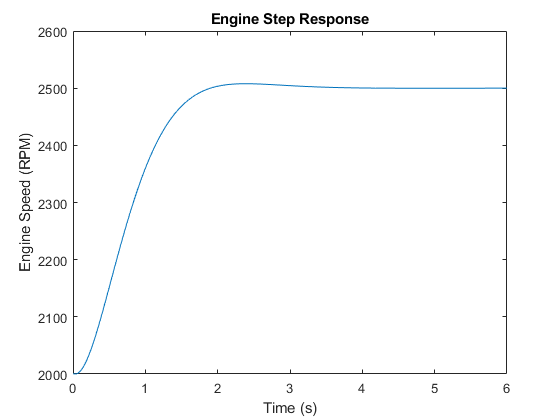 For this example, the validation simulation results are in EngineStepResponse. The response shows zero steady-state error and well-behaved transients with the following metrics.